Camaros have always held a special place for me. In my earlier days I longed for a Corvette, but could never quite justify the cost. The Camaro offered the next best thing at an affordable price. My first collectible car was a 1968 Corvette Bronze convertible that I bought in the mid-90s. My family “convinced” me to buy a 1998 Z28 convertible for my 50th birthday. I eventually sold both of them to buy my first new Corvette. 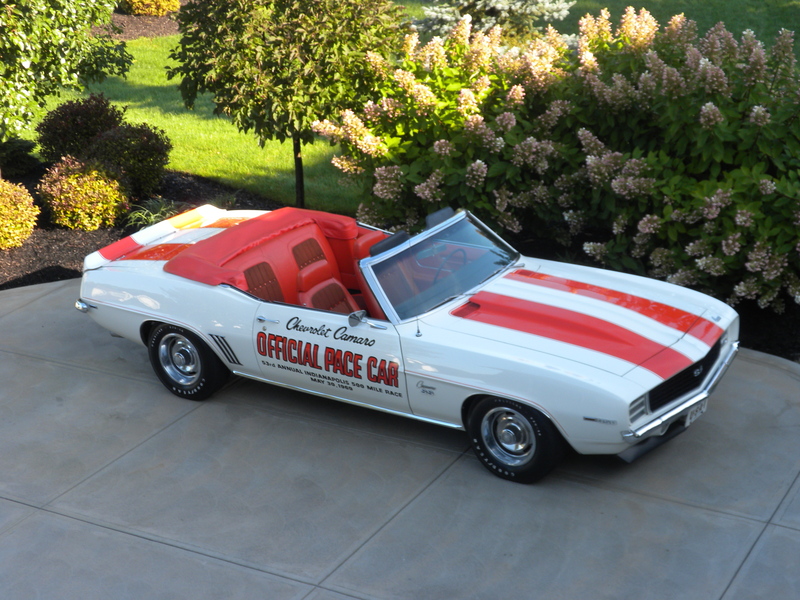 I decided about ten years ago that I wanted to find a ’69 Pace Car. I had looked at a ’67 Pace Car, and, even though they were rarer and probably more collectible, I really liked the look and color scheme of the ’69. After about two years of searching, I found one in Green Bay,WI. I agreed on a preliminary price on the phone and headed for Green Bay. As an example of my early car collecting naivete, I rented a car and drove it to Green Bay figuring I would just drive the Pace Car the 450 miles or so home. Other than having trouble finding the fuel cap (it’s behind the license plate) it was a relatively uneventful trip. Driving through Chicago in traffic in a thirty plus year old car did cause some concern. Thumbs up and waves from other drivers were rewards for the worry. Upon reflection, I realized I was lucky and vowed to have any future purchases shipped. The 1969 Camaro was the last of the first generation cars. 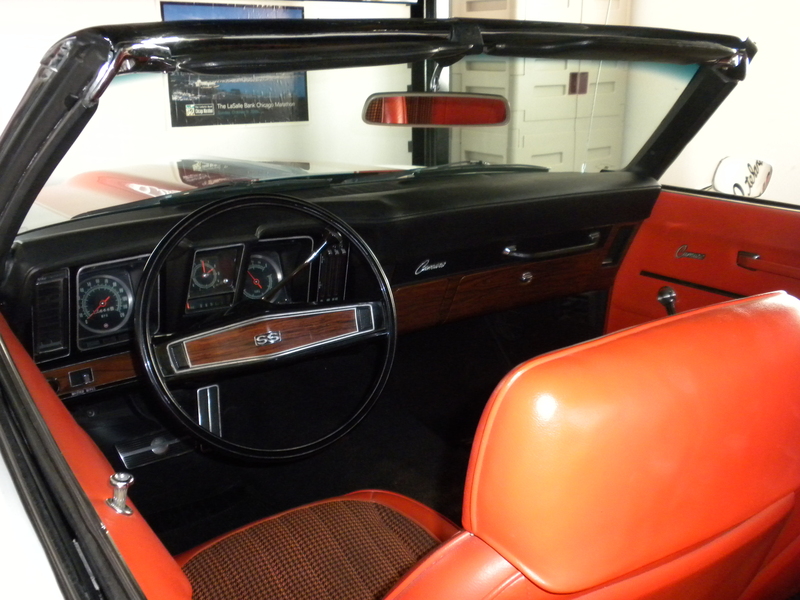 The exterior and interior were significantly modified from the 1968 model. The model year lasted longer that usual as the highly redesigned 1970 model was not yet ready for production. Many people, myself included, consider the ’69 Camaro the best of the first generation. The folks at Chevrolet must agree because there are definite 1969 styling cues in the new Camaros. Having owned a ’68 Rally Sport, I was often frustrated by the functioning, or lack thereof, of the vacuum operated headlight doors. For ’69 the vacuum system remained the same but slots were added to the doors to allow light to filter through in case they didn’t open as intended. It was a nifty solution, but increasing the reliability of the door operation might have even been a better answer to the problem. Another unique option with the ’69 Rally Sports was headlight washers. Once activated by the windshield washer button, two nozzles per headlight located above the light would spray water onto the bulb. Water came from the windshield washer reservoir. After much research and few new parts we were able to get the vacuum actuated headlight doors and the washers operating as originally intended. A car with both options working correctly is probably a rarity. 1969 was the second time Camaro paced the Indianapolis 500. The ’69 was similar in paint scheme to the ’67 Pace Car except the blue theme of the ’67 was changed to orange for the 69’s. While there were only a hundred or so ’67s sold to the public, Chevrolet decided to capitalize on the ’69s and built 3675 of them. Nearly all of the 1969 Pace Cars were convertibles (designated Z11), but a few coupes (designated Z10) were sold in the South. All Pace Cars were painted dover white with hugger orange striping and lettering. All of them were SS/RS optioned cars with 350 or 396 engines and cowl induction hoods. The interiors were orange houndstooth and the convertibles had white tops. 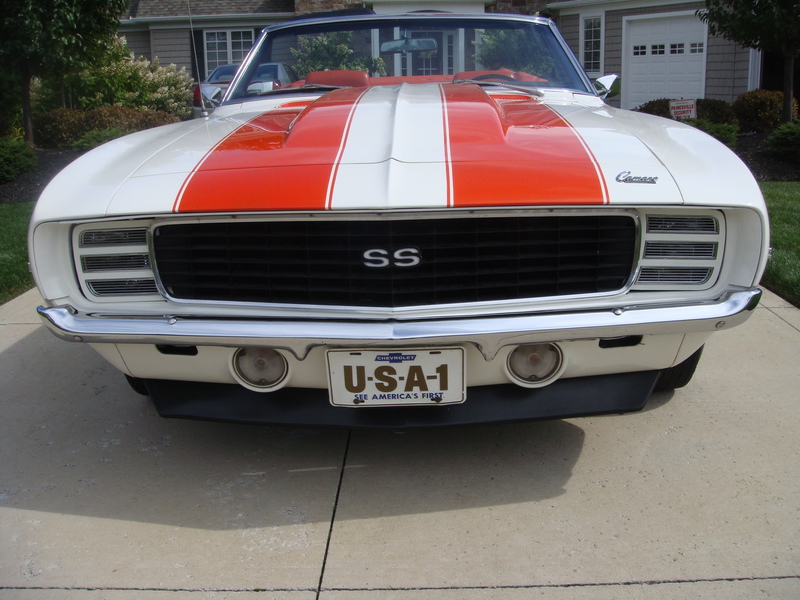 The pace cars were the only Camaros other than Z28s to have two broad stripes over the hood, trunk lid and spoiler. True pace cars do not have the dual stripes extended below the spoiler onto the trunk edge. The orange pin striping over the front wheel opening on pace cars stops at the rear of the fender and does not extend onto the door. 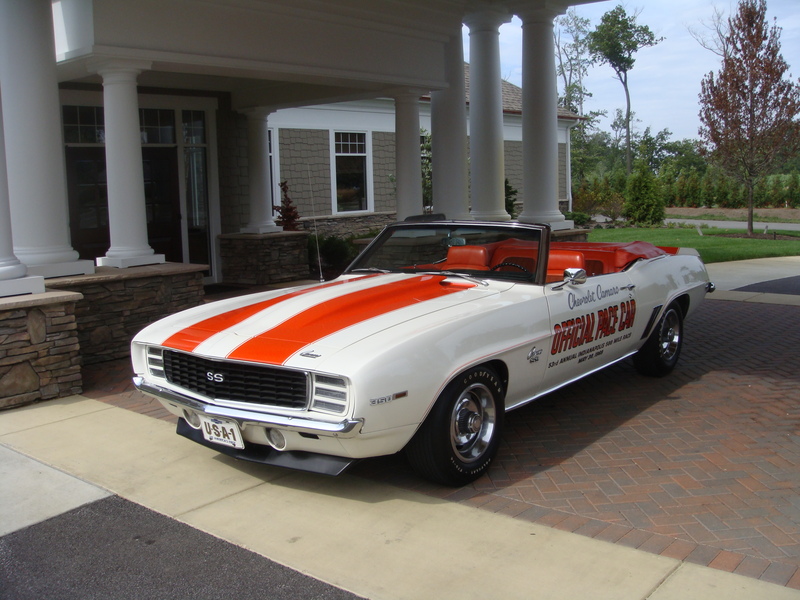 The Pace Cars were also the only ’69 SS models to have the rocker panels painted body color rather than the usual black. The door graphic decal was shipped to the dealer in the trunk. The purchaser could decide whether to have it applied to the door or not. 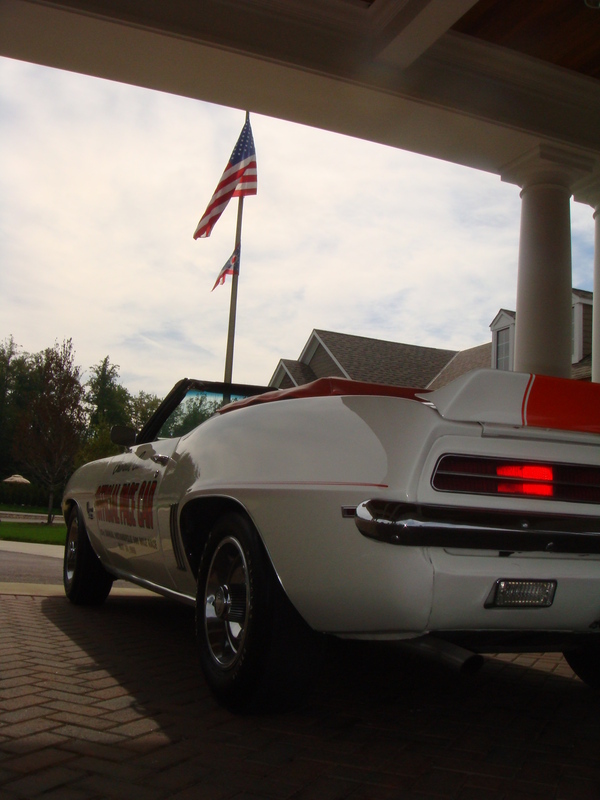 My pace car is a Z11 and was built in Norwood, OH in April of 1969. Casting dates on the engine and transmission correspond to the April build date. The engine stamping corresponds to the actual drive train. 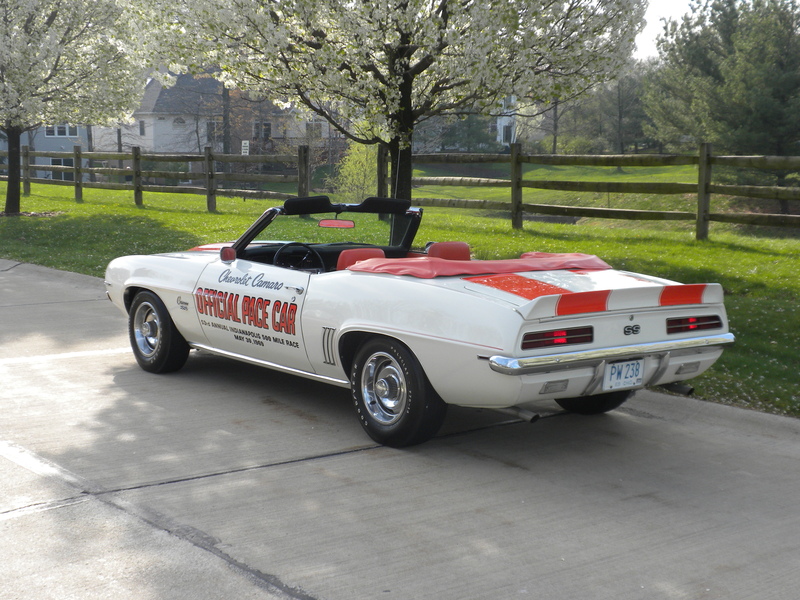 The car is registered with the National Pace Car Registry. 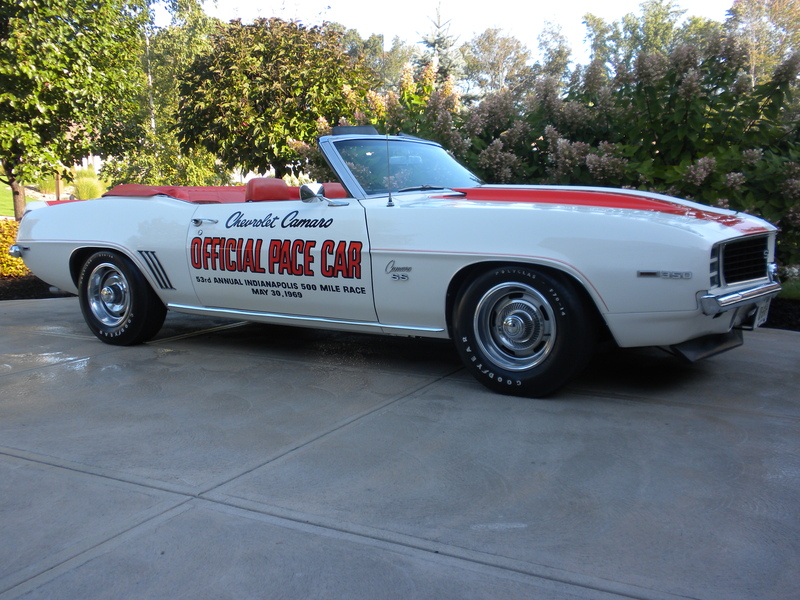 The pace car is equipped with the 350 cubic inch engine and a single four barrel carburetor that, with the cowl induction hood, produces 300 gross horsepower. Cowl induction added five horsepower to the 295 of the standard SS. The transmission is a Hydramatic 350 with a column shifter. The car is also equipped with power steering and power brakes (discs in front). The column shifter is somewhat rare. I was told by a knowledgeable pace car collector that it’s possible that some cars ordered without consoles may have been used as part of a promotion to reward high performing managers at Sprite. If so, the car could have been at the track. I have been unable to verify either the promotion or the possibility that the car was at the track for the race. Mario Andretti won the race in 1969, his only victory in the Indy 500. I have been fortunate enough to get his autograph on a 1/18th die cast model and on a photo of me standing next to the car. Both are proudly displayed in my garage. 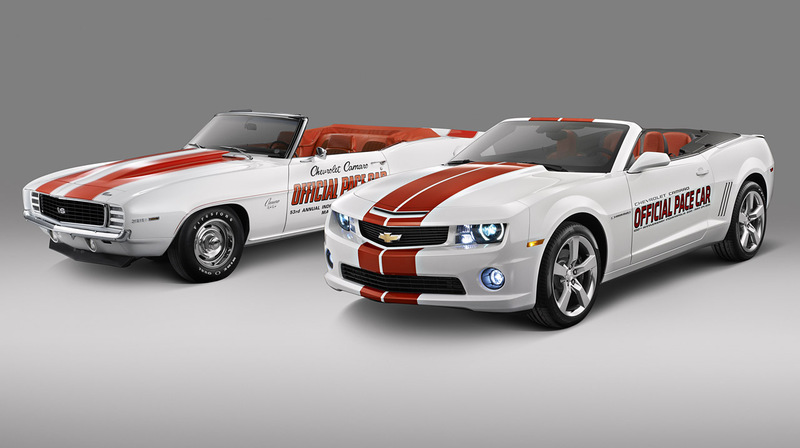 The new Camaro convertible was chosen as the official pace car for the 2011 Indy 500. The family relationship is unmistakable. The new pace car clearly shows its DNA. You have a wonderful collection of cars. I have my own collection of mostly 69 Camaros and I found your site by looking for a Pace Car Registry. Could you send me a link to their site, as I have not been able to locate them? With you car being built in April, I am pretty sure that it would not have been at the actual race. 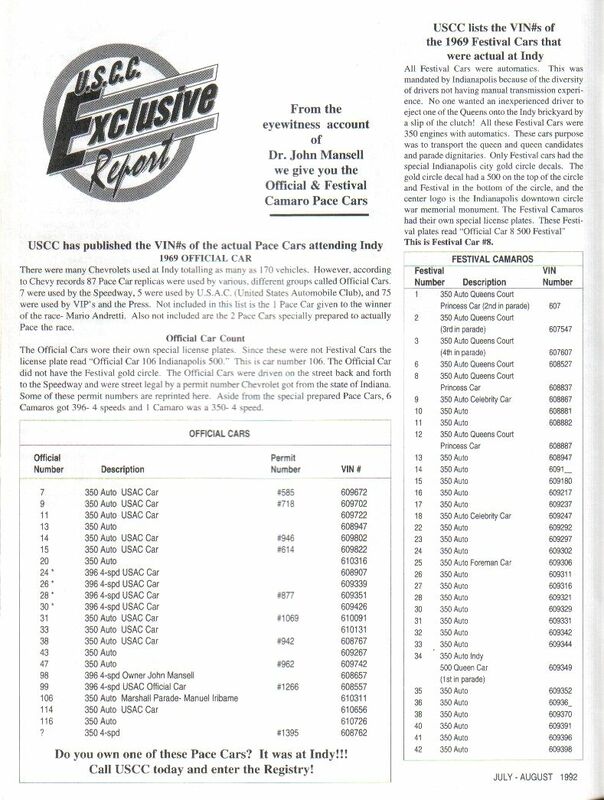 According to the Camaro Research Group the festival cars were mostly built in February. Mike, thanks for the information and the compliment. I checked the link that you sent and I think you are correct. All the vins at the track began with 60 or 61. Mine begins with 63, so it was a later build and not at the track. I checked my Pace Car Registry certificate and it showed certification by inspection by ICC (International Camaro Club) on August 2, 1992. At the top of the certificate it says, ICC’S OFFICIAL KEEPING PACE REGISTRY. If I’m not mistaken, ICC is now USCC. After I bought the car in 2001, I called the registry and talked to them about the car. As I recall, they were in Pennsylvania at the time. I have from what I have researched ( not verified) 1 of 10. 69 Indy Pace car numbers matching with 4 speed and AC. From what I can find, only Auto trans came with AC, 10 4 speed cars came with AC. Any way I can verify this?I am doing a museum level concourse restoration on the car. David, sounds like a great car. A car that may be just one out of ten is potentially valuable and certainly worth verifying. I would contact the guys at Worldwide Camaro Club through their website. They also have a pace car registry and a lot of information including vins of the ones that were at the track. Good luck. Hi phil, I am from pa. sounds like you might have my old pace car. my brother in law had owned since 1976. THE VIN MATCHES! IT’S YOUR OLD CAR. Thanks for getting in touch. That’s really cool. I’ll be contacting you separately to talk more about the car. Phil, Great car. I also have one but mine is the first week of may and my VIN ends in …635XXX. that seems to be the last week of production but I can’t verify that. I’ve only had mine for a year and drove it out of a barn after a 20 plus year rest. With 43K actual miles and sitting indoor and under cover it is the cleanest unmolested first gen that I’ve owned. They are great cars to enjoy and share stories about. Ben, The Sprite reference was shared with me by a local pace car owner who is a real authority on the cars. I have not been able to verify it by any other sources. The headlight washers were a little bit of a challenge. There is a control valve that mounts on the windshield washer pump that diverts flow to the headlights. I was able to find one on eBay at a cost of about $200. The valve came with directions, but was still difficult to route the hoses properly. After some experimentation, we were able to get them working. Patience is a real virtue as the headlight doors and washers can be frustrating to work with. I don’t know how many column shift cars were produced, and am not sure where to look for that information. Since the cars came standard with column shift and the console was an option, knowing the number of console optioned cars produced and subtracting that number from the total would yield the answer. I don’t think, though, that those numbers are available for just Pace Cars. Enjoy your Pace Car, Ben. You will be making lots of new friends.